Are you are hosting an Easter or Spring party anytime soon? I am going to share some ideas for simple Spring table decor that is affordable and able to be used over and over all year long! While I love certain Spring and Easter decor, I try to keep holiday decor to a minimum. I prefer to have staple pieces that can be used year round with little touches of colors, decor, and flowers that bring each holiday into the space. A fun way to dress up a table is to layer two different chargers to add some texture and interest underneath each place setting. Below I have shared four different charger options that I love for a Spring table, but could also be used year round! When layering the chargers you want to be sure that one is slightly larger than the other so you are able to see both materials once set. Above I layered a woven rattan charger with a silver charger on top. When it comes to dish ware I love white! I am definitely a neutral girl, but if you have special set of Spring dishes you could incorporate them into your table setting. What I love about white dishes is that you are able to add colors in other areas, like napkins and florals, without the table feeling too overwhelming. Another benefit to having white dish ware is that you only need one set of dishes for every occasion! This would especially be a smart choice if you are tight on kitchen space and don’t have room to store a lot of different options. The napkins are a great way to add a little color into the place setting. I also love the way it looks when two napkins are layered together. 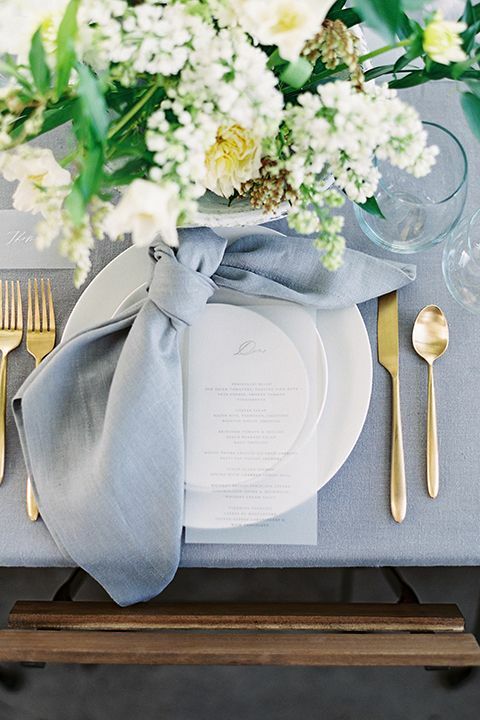 Pairing a soft Spring pastel color with a white or ivory napkin would make for a beautiful accent at each place setting. If you don’t have napkin rings you can try tying the napkins in a loose knot for a simple and casual look. You could also use ribbon or twine around each napkin. Add a sprig of fresh herbs to each one for another special touch. To pull it all together and really make your table festive for Spring time, add in your favorite Spring stems. I love a mixture of fresh cut stems in vases mixed together with potted Spring bulbs. Inexpensive terra cotta pots are wonderful for adding a beautiful natural element to the table. You can also find mini terra cotta pots online and at many garden centers. These make great place card holders and can be used to plant your favorite Spring flowers or herbs. These also double as a party favor for your guests! You can find the sources below for the pieces I have recommended and shown here. Happy Spring! You can visit me on Like it to Know it HERE to shop more of my favorites!